تونسي: مرحبا بيكم في الحاضنة متاع ويكيميديا! अङ्गिका: विकीमीडिया इनक्यूबेटर(ऊष्मायित्र)प॑ आपन॑ केरऽ हार्दिक अभिनंदन छै! العربية: مرحبا بكم في حاضنة ويكيميديا! mapudungun: Kümey tami akun Wikimedia Incubator mew! aro: Enai incubadorazo Wikimedia poi! azərbaycanca: Wikimedia Incubatora xoş gəlmisiniz! تۆرکجه: ویکی‌مئدیا اینکوباتورا خوْش گلمیسینیز! Boarisch: Servas und Griass Enk im Wikimedia Incubator! جهلسری بلوچی: په ویکی‌رشتا وش آتکگت! bal: مه ویکی رشتء تؤکا وش یهتگه! روچ کپتین بلوچی: بِه ویکی‌میڈیا ئنکوباتور‌ئی تا وش آته‌ئیت ! Bahasa Banjar: Salamat datang di Wikimedia Inkubatur ! нохчийн: Марша догIийла Инкубатор Викимедийа чу! cmn: Huānyíng guānglín Wikimedia Incubator! qırımtatarca: Wikimedia İnkubatorına hoş keldiñiz! Capiceño: Malipayon Nga Pag-abot sa Inkyubator sang Wikimedia! čeština: Vítejte na Wikimedia Inkubátoru! dansk: Velkommen til Wikimedia Incubator! Deutsch: Willkommen beim Wikimedia Incubator! Zazaki: Şıma xeyr amey Wikimedia Incubatori! Dusun Bundu-liwan: Kopisanangan korikatan doid Pongongomut Wikimodia! Ελληνικά: Καλώς ήρθατε στον Επωαστήρα του Wikimedia! English: Welcome to the Wikimedia Incubator! Esperanto: Bonvenon al la Vikimedia Inkubejo! español: ¡Bienvenido(a) a la Incubadora de Wikimedia! eesti: Tere tulemast Wikimedia Incubatorisse! estremeñu: Bienviniu(a) a la Encubaora e Wikimedia! français: Bienvenue sur l'Incubateur Wikimedia! français cadien: Bienvenue sur l'Incubateur Wikimedia! گیلکی: پيشاشؤن جيگا خوش باموييد! Ἀρχαία ἑλληνικὴ: Εὖ παρέστης ἐν τῷ Ἐπῳαστῆρι τοῦ Οὐικιμέσα! Alemannisch: Häärzli willkumme im Wikimedia Incubator! Hausa: Barka da zuwa Wikimedia Incubator! Hawaiʻi: Welina mai e Wikimikia 'Īkiubeta! עברית: ברוכים הבאים לאינקובטור של ויקימדיה! hrvatski: Dobrodošli na Wikimedijin Inkubator! magyar: Üdvözlünk a Wikimedia Inkubátorban! Bahasa Indonesia: Selamat datang di Wikimedia Incubator! íslenska: Velkomin á Wikimedia Incubator! Basa Jawa: Sugeng Rawuh ing Wikimedia Inkubator! jysk: Vælkøm til Wikimedia Incubator! ქართული: კეთილი იყოს თქვენი მობრძანება ვიკიმედიის ინკუბატორში! Qaraqalpaqsha: Wikimedia Inkubatorına xosh keldin'iz'! Taqbaylit: Ansuf yis-wen ɣef Incubator n Wikimedia! Адыгэбзэ: Фыкъеблагъэ Викимедием и инкубаторым! کھوار: ویکیپیڈیا اینکوبیٹرا خوشان گیور! қазақша: Уикимедия Инкубаторынa қош келдіңіз! 한국어: 위키미디어 인큐베이터에 오신 것을 환영합니다! къарачай-малкъар: Викимедиа Инкубаторгъа хош келигиз! Ripoarisch: Wellkumme em Wikimedia Incubator! лезги: Ша буюр Википедидин Инкубатордиз! Limburgs: Wèlkóm bie d'n Wikimedia Incubator! لۊری شومالی: خوش اۈمایت د ڤيکي أنکوباتور! لەکی: خوۀش هۀتینه ویکی مدیا اینکوباتور ! lietuvių: Sveiki atvykę į Wikimedia Incubator! latviešu: Esi sveicināts Wikimedia inkubatorā! Mizo ţawng: Wikimedia Incubator-ah kan lo lawm a che! لئری دوٙمینی: ڤە ڤیکی ئینکوٙباتۉر خأش ئوٙمیت! মেইতেই লোন্: ꯂꯦꯡꯁꯤꯟꯕꯤꯔꯛꯁꯤ ꯋꯤꯀꯤꯃꯦꯗꯤꯌꯥ ꯏꯟꯀꯨꯕꯦꯇꯔ ꯗ! Bahasa Melayu: Selamat Datang ke Wikimedia Incubator! Mirandés: Bienbenido a la Ancubadora de la Biquimédia! Napulitano: Bemmenute ncopp'â Wikimedia Incubator! नेपाली: विकिमीडिया ओथ्रामा स्वागत छ! Nederlands: Welkom op de Wikimedia Incubator! occitan: Benvenguda sus l'Incubator Wikimèdia! Pälzisch: Willkumme uffm Wikimedia Incubator! polski: Witaj w projekcie Wikimedia Incubator! Ποντιακά: Καλώς έρθετεν ση φωλέα τη Βικιμίντιας! português: Bem-vindo ao Wikimedia Incubator! português do Brasil: Bem-vindo(a) à Incubadora da Wikimedia! Runa Simi: Allinmi hamusqaykichik Wikimedia Incubator nisqapi! rej: Maroba busik nak Wikimedia Incubator! tarandíne: Bovègne jndr'â Uicchimèdie Incubator! русский: Добро пожаловать в Инкубатор Викимедиа! русиньскый: Вітайте на Вікімедія Інкубаторї! संस्कृतम्: विकिमीडिया अण्डकुलायनिलायस्ययन्त्र प्रति स्वागतम्! ᱥᱟᱱᱛᱟᱲᱤ: ᱥᱟᱹᱜᱩᱱ ᱫᱟᱨᱟᱢ ᱣᱤᱠᱤᱢᱤᱰᱤᱭᱟ ᱤᱱᱠᱭᱩᱵᱮᱴᱚᱨ ᱛᱟᱞᱟᱛᱮ! саха тыла: Викимедиа Инкубатарыгар нөрүөн нөргүй! sicilianu: Вinvinutu ntâ Wikimedia Incubator! Scots: Walcome tae Wikimedia Incubator! davvisámegiella: Bures boahtin Wikimedia Incubatorii! Åarjelsaemien: Buerie båeteme Wikïmeedia Incubator! српски / srpski: Добродошли на Викимедијин Инкубатор! Sranantongo: Wekome o de Wikimedia Incubator! Tašlḥiyt/ⵜⴰⵛⵍⵃⵉⵜ: brk ghu Wikimedia Incubator! shqip: Mirë se vini në Wikimedia Inkubator! svenska: Välkommen till Wikimedia Incubator! Kiswahili: Karibu katika Wikimedia Incubator! ślůnski: Witej we projekće Wikimedia Incubator! tetun: Benvindu iha Wikimedia Incubator! Türkmençe: Wikimedia Incubatora hoş geldiňiz! Türkçe: Wikimedia Incubator'a hoş geldiniz! reo tahiti: Manava i In'ubatori Vitimetia! тыва дыл: Инкубатор Викимедияже кирип моорлаңар! українська: Ласкаво просимо до Інкубатора Вікімедіа! Tiếng Việt: Chào mừng đến Wikimedia Incubator! wym: Sgiöekumt ym Wikimedia Incubator! მარგალური: კუჩხიბედინერ მოზოჯით ვიკიმედიაშ ინკუბატორშა! yua: Ki'imakchajak a wóol ichil Wikimedia Incubator! ⵜⴰⵎⴰⵣⵉⵖⵜ ⵜⴰⵏⴰⵡⴰⵢⵜ: ⴱⵔⵔⴽ ⴳ ⵜⵎⵙⴷⴰⵍⵜ ⵏ ⵡⵉⴽⵉⵎⵉⴷⵢⴰ! fmp: Sɑ̌' mbə̀pə̌' nɑ́ "Incubateur Wikimedia" ! If you haven't created a user page yet, please create one with for example User language templates on it. If you want to translate the interface, please go to Betawiki, create an account and follow the instructions you will see. If you have any questions, feel free to ask them on my talk page. Let me ask you this: how long do you think these Wikis will be sitting around in this state? Marrovi claims he has grammar books (not good enough still, "grammar books" do not make you a native speaker; I had grammar books for Navajo Wikipedia and the contents I wrote still ended up atrocious and discouraging to native speakers) or other data; but we aren't just talking about one or two languages here, we're talking about a dozen endangered languages which deserve far more respect than a copy-and-pasted page from a different test in the wrong language. Check it yourself: the Test Wikis for Mixe (Wp/mxp), Chol (Wp/ctu), Totonac (Wp/top), Guarijio (Wp/var) and O'odham (Wp/ood) are direct copies of the same page, which refers to the Yaqui language and has links to article titles in Yaqui! Why should we keep these? They were created by just copying and pasting, no information was even changed, how useful is that to anybody? And note that the Mayo Wikipedia (Wp/mfy) refers to itself as the Kiliwa Wikipedia on its mainpage! I am all in favor of having these pages when someone comes along who is willing to put in the time and effort necessary to have useful pages, but that's clearly not what has happened here. Could you please setup Mohau as test-admin for the newly created Sepedi Wikipedia. and this is my basic request!! how can I translate a message in luri lrc? and how can I add luri lrc in supported language in translatewiki same as english, arabic, germany and so on!!!! I ask for enable luri lrc and it takes a long time could you help me? please verify luri lrc language to eligible this language these days has many actions and increase it's articles, and this language has six active writers please help so thanks!!! Please respond my request here. Before and the after, thanks. so thanks for your helpe how can I change the page name? 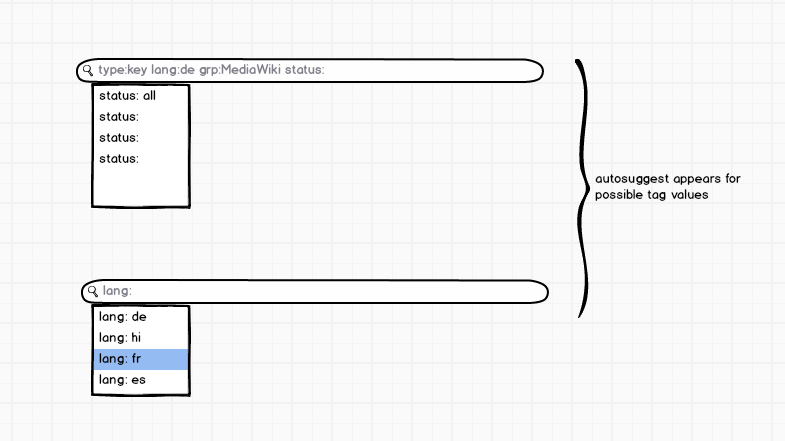 Is there any way to automate this process, or where do I even install the templates for use on a single subwiki of the incubator? hi my friend ! can you creat this for us in azb test wikipedia? can you help us to slove this templates errors? I am working to add new features to Search Translations (link) and would like your feedback on the same. I have an idea of a new feature, called "text search with autosuggest" through which you can specify your search filters in the search box itself (apart from the UI), and also have autosuggest to show the possible values for the filter options. An example is this. Please write a comment here about what you think of this feature. Also here you may read about the other improvements that are planned. Thank you and I shall be waiting for your feedback. South Azerbaijani Wikipedia (azb wiki) is active in last 12 month with at lest 3 editor. our wiki have 6108 pages, 25833 revisions, logo, 100% of the most used MediaWiki messages have been localised, a valid language code and now please say that what we need to do to improve our project? This discussion started regarding your comment. I want you to check block log and let me know if anything was done against the rules. Also please read w:Wikipedia:Hat collecting as well, I put a part of that here in case you're not going to read it: "Hat collecting is the process of gaining rights on Wikipedia (and other wikis) just to show off or to boost one's ego, rather than because you have any actual use for them." , also that's called harassing, I'm going to ask other people to comment on this. hi mr Ebe123.i think Southern Lurish "luz" main page "luz" Code lookup "luz"meets all the 4 criteria to be verified as eligible.if it has the possibility to be verified as eligible , please do it.thanks. There is something to be said for making "/status/approved" distinctive, too. Potentially, though, we could partially deprecate the template: let it stay for rejected (and maybe approved) projects, but ditch it for the vast majority of open (or not created) projects. The default test-wiki portal page simply returns an error on Miraheze. For now, we were simply going to avoid that problem by requiring the template. Statistics is something that I will definitely be working on first. However, for the translation of language codes to language names, that is dependent on the CLDR database, but it's a good idea to try and pull from our own data source (probably putting it as a MediaWiki message/JSON so that updates can be done on-wiki and changes are made live immediately). This page was last edited on 26 January 2019, at 04:37.